Here are my first couple of books. I’ve got lots of ideas and possibilities — we’ll see how many I get done! This book is all about comfort for hurting hearts directly from God through the Bible. It started out as a set of Scriptures my wife gave me on 3×5 cards when I was going through a very rough time. I took those cards and pondered them while walking at the Eldorado Nature Center in Long Beach. I then added more Scriptures and put them into a booklet and kept on walking. Other folks saw the booklet and wanted their own copy, so I printed more up. Now, this is the first book in a series of books about the Scriptures in the booklet. 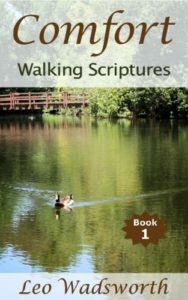 This book consists of a set of articles from insights gotten during the walks, some with pictures of the Nature Center, and the whole set of Scriptures. If you want, you can put this on a smartphone and use it just like the booklet during your own devotions or walks. The God of all comfort has comforted me, and now I want to share the comfort. I have had more practical growth from a long period of hurting than when times have been going great. This book is ideal for those who want to have God’s comfort in their lives. 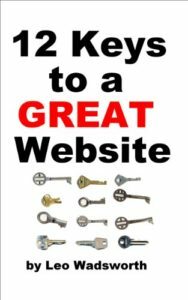 This book gives you the keys you need to make a truly great website. Using these practical, real-world principles you will know how to create websites that are among the best in the world. Each of these keys comes from experience with a wide variety of websites. They are presented in a clear, easy to understand format, making them easy to use. Simply put, this is THE book you should read to take your site from good to great.